Research has found that participating in sports can have a healthy developmental impact on young children. These activities can promote cooperative play, teamwork, and good sportsmanship while helping to refine gross motor skills. Sports can also help children get along with and become accepted by others, including peers, family members, teachers, and coaches. Plus, through positive feedback, group play builds self-esteem, helping your child realize that she’s a capable personal who is able to accomplish significant achievements. 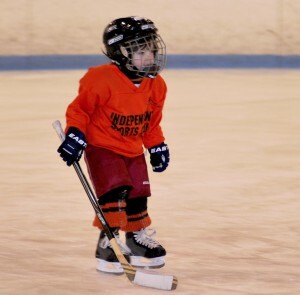 Many people would think that hockey is only for adults. Little do they realize that kids, even at such a young age, can play this challenging type of sport because they can benefit a lot from it. Just like in any other sport, hockey instills all the right values that the child needs to learn to be successful in life. Most people don’t realize it but sports that are being played by team such as hockey can bring about many advantages compared to those that are played by individuals. Primarily, the biggest advantage would be playing team sports such as hockey is that it is more fun since it involves so many personalities. • Instilling discipline in kids. This is very important because once discipline has been taught to a child early on, facing life’s challenges and achieving success will be easier. Being a competitive sport, a child develops discipline when he or she needs to follow rules during the game. Aside from acknowledging what are the things that could and couldn’t be done while playing, discipline can be instilled when the child is forced to follow a strict schedule for practice games. • Developing social skills. Since most team sports encourage people to interact and get along with other members while playing the game, playing hockey helps teach kids to develop good social skills to win the respective game. It is one way of learning how to properly mingle with other people and respecting their individual personalities. • Realizing the value of unity and cooperation. One of the major advantages of sports such as hockey is that it teaches each member the value of being one while playing the sport. Since everybody wants to win, all members will be forced to cooperate with one another to achieve a common goal of winning. • Improving levels of skills. As a team, the members are expected to rely on one another’s performances. 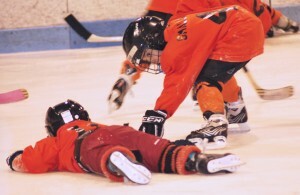 When playing team sports such as hockey, there is a possibility that the overall performance of the group will improve once they see each other’s desire to win. • Teaching patience. Aside from discipline, hockey also teaches children patience. 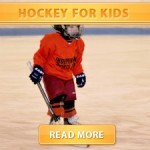 Since it is hard to play the game, kids who play hockey need to develop patience to be good at it. They need patience when they are being coached and when they practice.